Home prices in Singapore may have been moderating for several straight quarters now, as cooling measures introduced by the Government continue to take effect. However, while taking questions at the DBS Asian Insights Conference, Deputy Prime Minister and Finance Minister Tharman Shanmugaratnam said the cycle is "not over". "Market players will determine where the cycle goes. 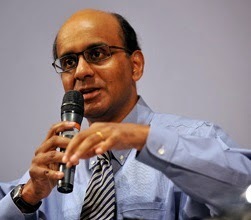 I don't think the industry will crash, because we moved early enough, and we moved each step of the game, knowing full well that what we do may not be enough, but knowing too well that if we did too much, it may engineer a crash," said Mr Tharman. "So we moved step by step, but we started early, so we avoided a huge bubble. That's why we won't see a crash. But I think further correction would not be unexpected." Since 2009, the Government has implemented several rounds of measures to cool the property market. These include buyer's and seller's stamp duties as well as loan curbs like the Total Debt Servicing Ratio framework. The supply of new HDB flats has also been ramped up to meet demand. Together, these measures have curtailed increase in home prices. The latest flash estimates from Urban Redevelopment Authority showed that private residential prices fell 1.1% in the second quarter of this year - the third consecutive quarter of decline. The government has said recently that it is too early to relax the property-cooling measures. How much must market prices fall in a year before it is deemed a "crash"? The wife and I understand that there is no official definition, but analysts typically consider a price correction of 5 to 10% as a "soft landing", while a drop of 15 - 20% is termed a "hard landing". So we reckon market prices must plunge some 25% or more before we can start mouthing the C word. 4 comments to ''No property market crash, says DPM"
Your comments are insightful and funny. Depending on the reader's state of mind. Hi, I bought my first property in end 2013 after doing my research. Looking at how the situation is developing, I'm not sure whether I made a right choice and bought at a right price. I guess only time will tell, and in property investing perhaps having holding power would somewhat help to mitigate downside risks. Congratulations on your first purchase! Our philosophy have always been that "as long as the price is something that you are financially comfortable with and can stomach, it is the right price". And whether it is cramming for an exam, embarking on a challenging task, running the marathon or some other strenuous "indoor activities", stamina (or in your words, holding power) always helps!